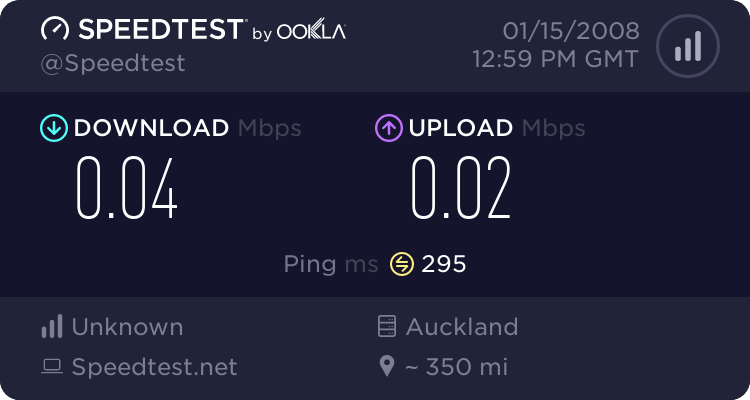 Speedtest.net launched their new fancy bandwidth tester recently. They are now leading the industry in internet speeds testing with an interface that could also double as a racing-car cockpit. I gave it a test drive (pun intended) to see how my ISP is performing. By adopting Senator Ted Steven‘s internet traffic measurement model, it looks like I could stream 10 movies across that internet, receiving enormous amounts of information, and won’t affect anyone else’s personal internet. But if I try to send the internet to someone else, they might literally get it tomorrow. Why? Not only because Ted Stevens doesn’t make sense, but because my upload is pathetic. OptusNet and Bigpond listen up, there is more to the internet than 256kbits/s. Stop restricting your customers to only 25KB/s uploads, cause all those teens around the country are going to get very frustrated when they upload their 100MB videos to YouTube. Hey Long, i got similar results too! Unfortunately, if you want decent/fast upload speeds, you’ll have to be on ADSL2 here in Australia.